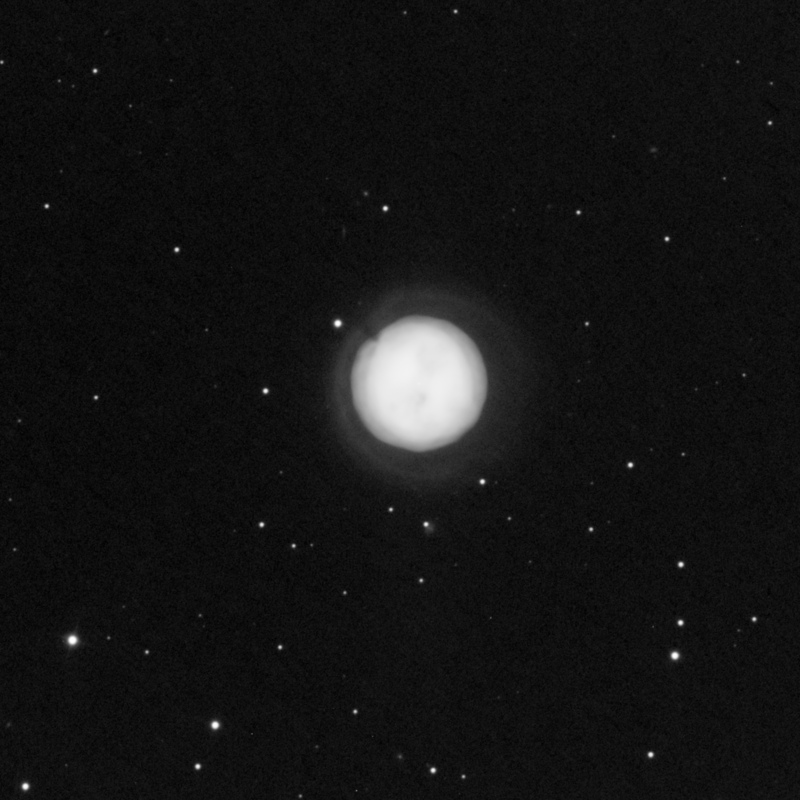 M97 (NGC 3587), better known as the Owl Nebula, is a bright mag 9.9 planetary nebula at RA 11h 14m 48s and DEC +55d 01m 10s in the constellation of Ursa Major. Its central star is mag 16 with about 0.7 solar mass and is very hot. The Owl is 2,600 light years distant and is thought to be 6,000 years old. It is a favorite target for astrophotographers being bright and large enough (2.8� in diameter) for most telescopes. The bright core shown here is a result of 10 hours of 20 minute exposures using ultra-narrow 3 nm narrowband filters for high contrast. This image was awarded an APOD in 2010. H-a was color-mapped to red, NII to green and OIII to blue. However, there is more to the story. Many planetary nebulae (see Balick, et al. �Stellar Wind Paleontology. II. Faint Halos and Historical Mass Ejection in Planetary Nebulae�, Astrophys. J. 392 (1992) pp 582-596) have halos extending beyond the bright core. However, they are typically 10,000 times fainter than the core and often do not appear in most images. Amateur-class telescopes require many hours of long exposures to bring the signal up to a point where the halo can be processed. In the last year, I was made aware that such a halo exists around M97. So, I collected an additional 10 hours of 3 nm OIII data from 30 min exposures over two nights recently, processed it and added it to my previous image of the core. I also added natural star colors with 1 additional hour of RGB data. The resulting color image from the 21 total hours of exposures is shown above. The 10-hour OIII monochrome image is shown below. The extended halo is clearly shown (~4.4� in diameter) with a bright rim (limb brightening) surrounding much of the object. According to Balick et al., a pulse of material is ejected, the expanding bubble is confined by the interstellar medium, the bubble slows down and the outflow of gas builds up at the leading edge producing the bright rim. These halos tend to be round. There is a �gap� in the halo near the 10 o�clock position that appears to be an extension of an H-a enriched projection within the edge of the core. 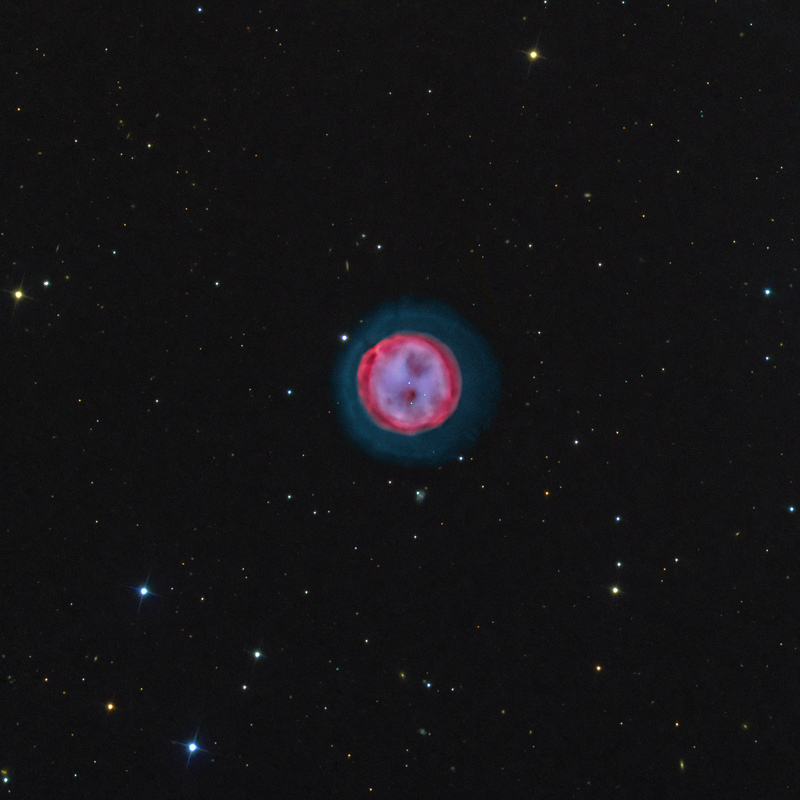 This is reminiscent of the OIII �gap� in M27, the Dumbbell Nebula shown in my previousnarrowband image. The small nebulous region near the star below M97 is a spiral galaxy PGC 34279 (mag 16) and the tiny edge-on spiral above M97 is PGC 2490291 (mag 17.4).